On May 1, 600 friends, former students, parents, and family members gathered at Msgr. Kelly Catholic High School in Beaumont, Texas, to honor Sister Emily Bordages, OP (Houston). Sister Emily has taught French for 50 years at the high school. 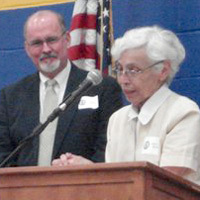 Principal Roger Bemis announced a scholarship that has been established in Sister Emily’s name. Several people gave personal tributes to Sister Emily, including two former students, current faculty, and Sister Jane Meyer, OP (former teacher and principal at Kelly). The Most Reverend Curtis Guillory, SVD, DD, Bishop of the Beaumont Diocese, gave the invocation and a tribute as well.